TASK: Analyze suspended animation principles. SCIENCE Cybernetics Wherever Borg in same hive, may prevent your Borg from being placed in stasis. This personnel’s special skill only prevents Borg personnel from entering stasis, and cannot release them from stasis once established. 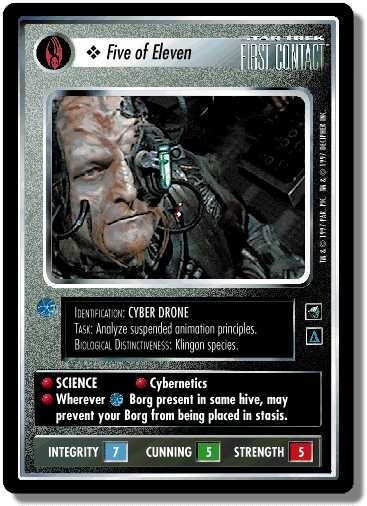 For example, a Cyber Drone in a group of Borg relocated to an unsolved Qualor II Rendezvous would prevent them from entering stasis, but it cannot release them if brought there after the relocation. It does not prevent ships from being placed in stasis (e.g., by the Quantum Singularity Lifeforms dilemma), though it can prevent the Borg personnel aboard from entering stasis. There are 23 entries for Five of Eleven (ST1E 4 C 80) at the Tradeplace (92 haves and 0 wants). Click here to see all trade list entries for this Common card!